The unconditional cancellation of all unjust and unpayable developing country debts is essential to achieve a more equitable distribution of the world’s financial resources. Governments in low- and middle-income countries are indebted to the tune of over $4tn dollars, and spend more than $1.4bn every day repaying these debts. On average, developing countries are returning over 400% more in debt service repayments than they receive in aid. Campaigners demand that at least $400bn should be cancelled for around 100 countries if they are to meet the basic needs of their citizens. However, cancelling illegitimate ‘dictator debts’ alone – estimated at $735bn - could free up $81bn a year for developing countries. Current progress on debt cancellation remains dangerously slow. A new international debt work-out mechanism is urgently needed to resolve sovereign debt crises and disputes in a fair and transparent manner. There is also an urgent need for stronger rules that will ensure more responsible lending and borrowing in the future, in order to prevent the accumulation of further unsustainable and illegitimate debts. Unjust and unpayable sovereign debt is an ongoing problem in many low- and middle-income countries where it often diverts huge sums of public money away from government spending on vital welfare and social services. These debt repayments not only hamper economic development but also facilitate a significant transfer of financial resources from poor countries to wealthy creditors in the North. As a key part of the redistributive measures highlighted in this report, this counter-productive flow of the world's financial resources must be reversed through the cancellation of all unjust and unsustainable debts in developing countries. Developing countries currently have a total external debt stock of over $4,076bn, which includes a large proportion of public and publicly guaranteed debt owed to international financial institutions (multilateral debt), the governments of rich countries (bilateral debt), as well as banks and private companies (commercial debt) [see note]. These huge government debts attracted large amounts of interest over the past three decades, and numerous countries have repaid many times their original loan value in interest. Developing countries currently spend over $1.4bn every day repaying these debts, of which $23m each day is paid by countries in sub-Saharan Africa alone. When compared to the latest figures for official development assistance (ODA), the developing world is returning over 400% more in debt service repayments than it is receiving in aid. Moreover, a significant proportion of these repayments go to the same countries and development agencies that provide ODA in the first place. The reality of these financial flows into and out of developing countries makes a mockery of aid donations and further highlights the urgent need for rich donor countries and multilateral institutions to drop all the unsustainable and unjust debt owed to them. Rather than using a developing country's scarce financial resources to fulfil the demands of its rich lenders, these funds could be spent on social welfare and public services that are urgently needed. According to the World Bank, countries that received debt cancellation through multilateral debt relief initiatives increased how much they spent on poverty reduction by an average of 10% between 2001 and 2009. Despite the economic crisis, this spending was expected to increase further to reach an average of almost a tenth of these countries' GDP. Such figures are part of the clear and mounting evidence that debt cancellation has a hugely positive impact and is among the most effective forms of financing poverty eradication for the developing world - thereby contradicting the arguments of detractors who claim that money from cancelled loans will only line the pockets of corrupt regimes. In the longer term, debt cancellation can contribute towards economic growth in the poorest countries and help reduce their dependence on aid. Removing debt can also help free governments from the policy diktats of the International Monetary Fund and World Bank - lenders who required a harsh restructuring of economies as a condition to lending in the past, similar to the austerity measures recently imposed on the populations of Greece and other European countries [see box]. Debt cancellation can therefore increase economic sovereignty and public participation in democratic processes, enabling people rather than international financial institutions to hold their governments to account. Of the various types of debt, the substantial amounts that developing countries owe to export credit agencies (ECAs) - quasi-governmental institutions that help finance business activity abroad - remains a major area of concern [see note]. According to research by Eurodad, on average 80% of poor country debts owed to Northern governments is a result of export credits, not development loans. In the UK alone, over £2bn (US$ 3.1bn) from failed UK exports are being repaid by developing countries, making up 96% of ‘Third World' debt to the UK. Developing countries including Indonesia, Kenya and Pakistan have paid an average of £700m (US$ 1.1bn) annually to the UK's Export Credits Guarantee Department over recent years. Although much of the focus of debt cancellation and debt relief has been on bilateral debts (a sum of money owed by the government of one country to the government of another country) and multilateral debts (when many countries owe debts to a central fund such as the IMF or World Bank), commercial debt accounted for the main bulk of developing countries' overall debt burden prior to the global financial crisis in 2008. This huge proportion of public debt owed to private creditors has mainly affected middle-income countries, but many low-income countries have also been turning to international capital markets for loans as their economies developed. These debts were a key driver of the existing debt vulnerabilities faced in many developing countries today, yet private lenders are typically unwilling to take part in debt relief initiatives. Although private lending dramatically decreased in the wake of the financial crisis, private debt flows are already resuming and expected to continue to grow. This could soon lead to a new wave of illegitimate debt for poorer countries and increased debt vulnerability, especially with the weaker regulation of private debt and in the absence of binding responsible lending standards. A further problem is that so-called ‘vulture funds' have made huge profits by purchasing the outstanding private debts of developing countries and aggressively pursuing their governments through the courts for repayment. Often this has meant taking money from countries in a state of extreme financial distress that are already unable to meet the minimal obligations of their people for basic welfare and services. According to the World Bank, the top 26 vulture funds have managed to collect $1bn from the world's poorest countries, and still have a further $1.3bn to collect - equivalent to more than the entire UN appeal for the famine in Somalia in 2011. The definitions currently used by donors to determine whether a country's debt is ‘unsustainable' and therefore eligible for debt cancellation fail to take into account the social and human cost of debt burdens, or the past failure of creditors to lend responsibly. Under the current definition, ‘debt sustainability' is narrowly defined without taking into account urgent demands on public funds, such as welfare provision. This inhibits governments in many developing countries from meeting the basic needs of all their citizens. It is vital that a definition of sustainability based on human need is adopted in order to determine how much more debt cancellation is actually required, and that truly ‘unsustainable' debts are cancelled as a matter of principle. Jubilee Debt Campaign estimates that at least $400bn should be cancelled for around 100 countries if they are to ensure that the basic needs of their citizens can be secured through the provision of essential services. This could result in a total of $44bn being made available for public spending in these countries every year. Much of the debt that poor countries are expected to repay can also be considered odious or illegitimate, meaning that the loans were made irresponsibly and did not benefit the populations of developing countries, hence they should not be held liable for the outcome. Although illegitimate debt has no existing definition in law, there is much academic and legal literature on the issue which focuses on creditor responsibility and includes loans made to oppressive regimes; to known corrupt officials; for ill-conceived or overpriced projects; or granted on unacceptable terms, such as usurious interest rates. A narrower concept is odious debt which refers to an oppressive regime which uses the money for purposes other than the "needs and interest" of the country. The proceeds of such loans were often stolen or wasted but successor governments are still expected to service them, while the creditors deny any responsibility - hence the term ‘odious lending' has been considered a more accurate description. Among the many examples of odious or illegitimate debts, it was estimated in 2006 that more than $735bn can be attributed to dictators in 32 different countries, representing more than a quarter of all developing country debt [see note]. Cancelling these illegitimate ‘dictator debts' alone could free up a total of $81bn each year for developing countries. Debt cancellation is an essential prerequisite for ensuring a more equitable sharing of global financial resources. Without removing these financial obstacles that pose such a huge drain on a country's resources, it will be impossible for many countries to strengthen their social protection and welfare systems, or achieve substantial progress in reducing poverty and deprivation. As the prospect of a global recession looms, the absolute and unconditional cancellation of all unjust and unpayable debts is more urgent than ever before, and should constitute an urgent priority for the international community in the drive to eradicate world poverty. Much more research needs to be carried out to determine the proportion of debt that should be liable for cancellation, and how much additional revenue this would create for indebted governments. According to calculations by campaigners, at least $400bn of debt should be cancelled for around 100 countries in order for them to secure the basic needs of their citizens. However, $735bn of debt accruing to 32 different countries is attributed to dictators and deemed illegitimate [see table 2]. Cancelling this sum alone could raise $81bn each year for developing countries. Cancelling illegitimate ‘dictator debts': $81bn per year for developing countries. Campaigners, development economists and even some donor countries have long championed progressive debt cancellation as a predictable, flexible and low cost method of financing poverty eradication. The global call to cancel ‘Third World Debt' first reached a crescendo with the success of the Jubilee 2000 campaign. So far, over $121bn of multilateral, bilateral and commercial debt has been cancelled for 32 countries as a result of consistent pressure from civil society, although this represents less than one tenth of the existing stock of public debt in developing countries. Existing debt relief procedures such as the Paris Club, the Highly Indebted Poor Countries initiative (HIPC) and the Multilateral Debt Relief Initiative (MDRI) are slow, restrictive and exclusive processes that do not constitute a permanent solution. They are piecemeal in character and have been initiated and controlled by lenders without sufficient representation of debtor interests. Moreover, these approaches have been designed to protect the interests of creditors rather than seriously resolve the debt crisis for poor countries. The HIPC initiative - the major international scheme for debt relief and cancellation - still imposes economic policy conditions on poor countries, such as public spending cuts, privatisation of basic services and trade liberalisation. All of the existing debt work-out mechanisms are so ineffective that by 2011, a quarter of low-income countries that had obtained debt relief were at high risk of renewed debt distress. As mentioned above, another major limitation of current debt relief efforts is that the participation of commercial creditors is voluntary. Only 6% of all commercial debts covered by the HIPC initiative has been cancelled, while countries with larger commercial debt burdens are not even eligible for the HIPC scheme. Many campaigners also continue to call on rich country governments to write off their outstanding export credit debts for low- and middle-income countries, especially those that are considered odious (i.e. found to originate in irresponsible lending, such as those taken on by dictators and similar regimes). Although export credit debt has reduced under the HIPC initiative for 36 countries, much of the debts owed to Export Credit Agencies (ECAs) are from countries that do not qualify for the HIPC and therefore remain on the books [see footnote 6 for more on ECAs]. The specific principles upon which debt crises can be adequately resolved and future lending better regulated are already well established. For a start, any new lending must take into account the essential components of a responsible loan, ensuring that terms and conditions are fair, arrangements are transparent, human and environmental rights are respected, and repayment difficulties are resolved fairly and efficiently. With the introduction of a new framework for responsible lending, the practice of attaching policy conditions to loans or debt relief (commonly referred to as ‘structural adjustment') would no longer be a legitimate practice. Many campaigners are calling for an international mechanism that allows debtors to legally contest the validity of debts they are currently repaying. Various calls for an international debt work-out mechanism or ‘debt court' have been echoed by Eurodad, Jubilee Debt Campaign, the New Economics Foundation and others. All of these proposals include the creation of an independent body empowered to resolve sovereign debt crises and disputes in a fair and transparent manner. Other proposed measures include a new definition of debt ‘sustainability' that ensures debt repayments do not divert government spending needed to meet basic human development needs; and a comprehensive debt audit to establish ‘odious' or ‘illegitimate' debts. There are some signs of progress towards a fairer and more comprehensive system for debt cancellation. Several creditor governments have recently signalled a new interest in international sovereign debt work-out procedures and responsible lending guidelines, including Norway, Germany and the Netherlands. In October 2006, the Norwegian government broke new ground by becoming the first government to unilaterally cancel specific debt claims on the grounds that the loans in question represented "failed development policy". Furthermore, UNCTAD announced a three year project on the issue of responsible lending and odious debt in March 2009. The initiative, financed by the Norwegian government, brings together representatives from the private sector, civil society, official bodies and governments that in 2011 presented a draft set of guidelines for what constitutes responsible lending and borrowing practices. The Group of 77 developing nations have also indicated strong support for an open, impartial and transparent debt tribunal at the UN Financing for Development Conference in 2008. 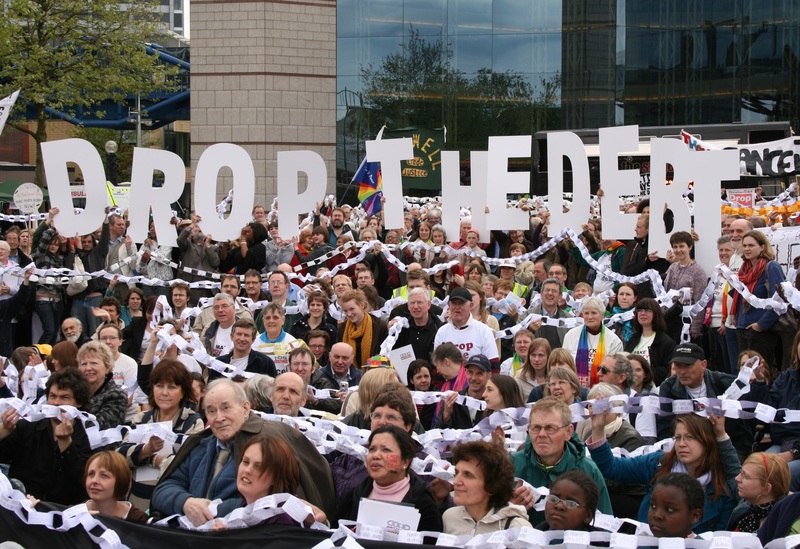 After years of campaigning by civil society groups, a landmark law was passed by the UK government in April 2010 (made permanent in March 2011) to protect the poorest countries in the world from profiteering by vulture funds through UK courts, helping to ensure that public money given towards debt cancellation is not diverted to private investors. However, a legal loophole still exists in the UK law that allows vulture funds to exploit courts in the offshore tax haven Jersey and other UK Overseas Territories, and there remains a lack of global standards for responsible lending that could constrain such aggressive litigations. Despite these limited developments, progress on comprehensive debt cancellation remains dangerously slow. Many poor countries are still labouring under unjust and unsustainable debt burdens, and creditor-controlled debt relief schemes continue to impose various forms of austerity and economic restructuring on debt-stricken nations. According to the IMF, one out of three low-income countries is in debt distress or at high risk of debt distress - a figure that would be far higher if human needs are factored into the equation. Now that sovereign debt crises are reverberating across Europe, the same pattern that has afflicted the Global South for decades is being repeated in high- and middle-income countries - the public are being forced to pay for private debt that they were not responsible for creating [see box]. Given the shared experience of these damaging financial burdens in all countries, it is time for campaigners to place their demands for debt justice at the heart of any strategy for international financial redistribution. The austerity measures being implemented across Europe in response to the financial crisis are not a new idea. They have been the standard response to financial crises over the last thirty years, particularly in the developing world. In the early 1980s Zambia, like many southern countries, suffered from a financial crisis after a decade of lending by foreign banks and a sudden increase in US interest rates. The IMF bailed out the banks by lending to keep Zambia from defaulting on its debts. But in return the IMF foisted a programme of cuts in government spending and liberalisation on the Zambian economy. Cuts in government spending contributed to Zambia suffering from a severe recession for much of the 1980s and 1990s. By 1995, the Zambian economy had declined by more than 30% on 1980 levels, whilst government expenditure had been cut in half. Yet the cuts in spending failed to reduce Zambia's debt. When the IMF intervened in Zambia in 1983 the government's foreign debt was 75% of GDP. By 1995 it had doubled to 150%. At the same time Zambia reduced government expenditure at a rate "virtually unmatched in Africa" and was praised by the IMF and World Bank for doing so. The same austerity medicine applied in Latin America and Africa in the 1980s and 1990s was used in Asia following the financial crisis in 1998. In the run-up to 1997, countries such as Thailand and Indonesia had deregulated their financial sectors, allowing huge amounts of foreign private lending into their economies. Their governments actually enjoyed budget surpluses. When the private boom bust, however, the IMF was called in to bail out foreign private lenders and set conditions on economic policy. Thailand and Indonesia were made to cut government spending and try to increase government revenue. The result was huge economic decline. The Indonesian economy shrank by 13% in 1998, the Thai economy by 9%. The UK government is now following similar policies. The immediate response of the UK government to recession was to allow spending to increase to partially offset the collapse in the private sector. As the country comes out of recession, the government has started to impose swingeing cuts in public spending. As happened in Zambia, Thailand and Indonesia, these cuts could be self-defeating by pushing the UK back towards recession and so fail to reduce the deficit. The lesson from the global South is that cutting public spending does not necessarily reduce public debt. Ireland's private sector borrowing spree was even larger than the UK's, running up an estimated private debt to foreign lenders of 600% of GDP by 2008. Just like Asian countries before their financial crisis, Ireland had government budget surpluses in the years leading up to the recession. When the crisis hit, the Irish government bailed out the private banks, massively increasing its debt liabilities. But it also immediately started trying to reduce public spending, pushing the economy further into recession. Again, the cuts became largely self-defeating as the ensuing recession increased the relative size of government debt, and reduced its ability to pay. This is why Ireland is once more in crisis. Drastic measures to reduce government spending are a common theme of debt crises from Zambia to Indonesia to Ireland and the UK. These austerity measures tend to take very similar forms. a) Regressive tax changes - increase taxes which are charged at a flat rate and increase the number of taxpayers, whilst keeping low or reducing taxes on income and trade. This means an increase in so-called regressive taxation, which places a greater burden on the poorest, and a decrease in progressive taxation, which places a greater burden on the richest. Through the 1980s and 1990s Pakistan implemented several structural adjustment programmes from the IMF and World Bank. One of the policies introduced was to increase sales taxes whilst reducing taxes on imports. As a percentage of tax revenue, sales taxes in Pakistan increased from 7% in 1980 to almost 30% by 2000. Overall, taxes increased by 7% for the poorest households, whilst falling by 15% for the richest. In the UK the main tax increase has been in its sales tax - VAT - a flat tax which is paid by everyone, and disproportionately affects the worse off. In contrast, the standard rate of income tax in the UK remains at its lowest level since the Second World War. b) Corporate deregulation and tax breaks - remove regulations and taxes on multinational companies. A 2005 survey of IMF and World Bank supported Poverty Reduction Strategy Papers in low income countries found that 78% include measures to deregulate or give tax incentives to multinational companies. In the UK, the main rate of tax on company profits is being reduced from 28% to 24% over four years. c) Welfare cuts - remove government payments which protect the poor. In the UK it is estimated that the poorest 40% of the population will lose over 1% of their income solely through cuts in welfare payments over coming years. Even in the poorest countries in the world, which have struggled to ever afford similar kinds of welfare payments, payments to the poor have been cut in various ways through austerity measures. For instance, IMF and World Bank programmes have often included introducing user fees for basic services such as health and education. In Zambia in the 1990s user fees for health services were introduced. By 1994 the World Bank was reporting that outpatient attendance in urban Lusaka had fallen by 60% and that "vulnerable groups seem to have been denied access to health services". Despite this, the Bank continued to push for increased use of user fees. d) Privatisation - a further key requirement of the Washington Consensus has been to privatise public companies and services whilst removing government support for strategic industries. IMF and World Bank-pushed privatisations have included banks, mines and water utilities. In the UK, the same sweep of privatisations happened in the 1980s and 1990s. Further privatisations continue today with the abolition or privatisation of quangos. It is important to note that these policies were not only economically damaging to countries in the global South, they were also undemocratic. They essentially removed power from ordinary people and made ‘debtor' governments accountable to international institutions and rich countries. This loss of sovereignty is exactly what Irish activists fear today. Note: Private non-guaranteed debts are also included in this figure, as there is a growing recognition by analysts that private debt and contingent liabilities can be of significant relevance to a country's overall debt vulnerability. For example, private debts can be transferred to the stock of public debt when countries experience a financial crisis. In both rich and poor countries, domestic debts are growing rapidly and can also become a significant liability for governments. However, domestic debts are not included in the $4tn figure as they do not lead to capital leaving the country. For figures see World Bank,Global Development Finance 2012, External Debt of Developing Countries, Washington, D.C., 2012, p. 40. Note: Figure calculated as total of principle repayments plus interest payments for 2010, which equals $537,844m in 2010 or $1,473m a day. See World Bank, Global Development Finance 2012, op cit, pp. 41, 53. ODA in 2011 = $133.5bn (see section in this report on ODA); combined principle and interest repayments on total long term external debt in 2010 = $538bn (World Bank, Global Development Finance 2012, op cit). International Development Association and International Monetary Fund, Heavily Indebted Poor Countries (HIPC) Initiative and Multilateral Debt Relief Initiative (MDRI) - Status of Implementation, 14th September 2010, p. 11. Øygunn Sundsbø Brynildsen et al, Exporting goods or exporting debts? Export Credit Agencies and the roots of developing country debt, Eurodad, December 2011. Jubilee Debt Campaign, The Department for Dodgy Deals: Ending the UK's support for toxic debt, January 2011. Wiert Wiertsema and Oygunn Brynildsen, ‘Private debt flows to sovereign borrowers: An opportunity for independence or a threat to development? ', in Eurodad and CRBM International Conference, The private turn in development finance: Effective for development?, Background paper, Rome, 18-20th May 2011. Greg Palast, Maggie O'Kane and Chavala Madlena, ‘Vulture funds await Jersey decision on poor countries' debts', The Guardian, 15th November 2011. CIDSE, The New World Bank / IMF Debt Sustainability Framework: A Human Development Assessment, April 2006. These figures are based on calculations by the New Economics Foundation. See Jubilee Debt Campaign, Unfinished business: Ten years of dropping the debt, May 2008, appendix 3, pp. 29, 39. Note on calculation: The following figures refer to ‘public and publically guaranteed' external debt only. In 2010, developing countries paid $180bn servicing $1,583bn of debt, which represented 11% of the total value of their debt stock (World Bank, Global Development Finance 2012, op cit). We therefore estimate that the annual combined savings for developing country governments is 11% of the total amount of debt cancelled. If $400bn of debt was cancelled, 11% of this amount is $44bn in potential savings. Jubilee Debt Campaign, Unfinished business, op cit. For more detail see: Joseph Hanlon, ‘Defining Illegitimate Debt: Understanding the Issues', Norway: Norwegian Church Aid, 2002. Also for legal case studies on illegitimate debt, see: Max Mader and André Rothenbühler (eds), How to Challenge Illegitimate Debt: Theory and Legal Case Studies, Aktion Finanzplatz Schweiz, Basel: November 2009. Stephen Mandel, Odious lending: debt relief as if morals mattered, New Economics Foundation, September 2006, p. 16. Note: The most recent figures compiled by Dr Joseph Hanlon for dictator debts are now out of date as, for example, much of the Zaire debt from Mobutu Sese Seko no longer exists and Iraq's external debt has been restructured, whereas Egypt has inherited a $30bn debt from Mubarak and his predecessors. Individual country figures may have therefore gone up or down in recent years, but the total figure of $735bn is still a reasonable guide for illustrative purposes. See: Joseph Hanlon, ‘Illegitimate' Loans: lenders, not borrowers, are responsible, Third World Quarterly, Vol. 27, No. 2, 2006, table 1, p. 217. Note on calculation: The following figures refer to ‘public and publically guaranteed' external debt only. In 2010, developing countries paid $180bn servicing $1,583bn of debt, which represented 11% of the total value of their debt (World Bank, Global Development Finance 2012, op cit). We therefore estimate that the annual combined savings for developing country governments is 11% of the total amount of debt cancelled. If $735bn of debt was cancelled, 11% of this amount is $81bn in potential savings. See footnotes 16 and 17. As of 2010, $76bn of debts have been cancelled under the HIPC initiative, $33.8bn under the MDRI and additional debt relief of $11.9bn has been provided by the Paris Club creditors. See IDA and IMF staff, ‘Heavily Indebted Poor Countries (HIPC) Initiative and Multilateral Debt Relief Initiative (MDRI) - Status of Implementation and Proposals for the Future of the HIPC Initiative', 8th November 2011, pp. 12-13. Isabel Ortiz et al, Prioritizing Expenditures for a Recovery for All: A Rapid Review of Public Expenditures in 126 Developing Countries, United Nations Children's Fund (UNICEF), New York, 2010. Jubilee Debt Campaign, Unfinished business, op cit, p. 28; IDA and IMF staff, 'Heavily Indebted Poor Countries...', op cit, p. 16. Wiert Wiertsema, Export Credit Debt How ECA support to corporations indebts the world's poor, Briefing Note, 5th June 2008. Jubilee Debt Campaign, Unfinished business, op cit, pp. 27-28. Gail Hurley, ‘EURODAD Charter on Responsible Financing', Eurodad, January 2008. Gail Hurley, ‘EURODAD Charter on Responsible Financing', op cit, p. 5. Jubilee USA, ‘Recent Developments on Odious & Illegitimate Debt', April 2008. Sarah Edwards, A new debt crisis? Assessing the impact of the financial crisis on developing countries, Jubilee Debt Campaign, March 2009, p. 19. Jubilee Debt Campaign, Latest News, ‘VICTORY: Vulture funds law set in stone', 28 March 2011. Jubilee Debt Campaign, ‘Vulture Fund awarded $100m in Jersey court', 4th November 2010. IDA and IMF staff, op cit, p. 21.